The Art of Music is pleased to announce two publications typeset in association with The Centre for Advanced Welsh Music Studies at Bangor University. We have also supplied the InDesign™ template for Welsh Music History / Hanes Cerddoriaeth Cymru vol. 7, published by The University of Wales Press. Music has also been engraved for a number of related projects. 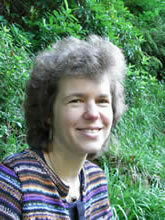 Sally Harper is Deputy Head of the School of Music at Bangor University in North Wales, and Director of The Centre for Advanced Welsh Music Studies at the University. Containing 480 pages, this book provides the first serious study of Welsh music before 1650 and draws on a wide range of sources in Welsh, Latin and English to illuminate early musical practice. Music in Wales has long been a neglected area. Scholars have been deterred both by the need for a knowledge of the Welsh language, and by the fact that an oral tradition in Wales persisted far later than in other parts of Britain, resulting in a limited number of sources with conventional notation. The book challenges two prevailing assumptions, both of them false: namely (a) that music in Wales before 1650 is impoverished and elusive; and (b) that the extant sources are too obscure to warrant serious study. Harper demonstrates that there is a far wider body of source material than is generally realised, comprising liturgical manuscripts, archival materials, chronicles and retrospective histories, inventories of pieces and players, vernacular poetry, and treatises. The book is structured around three distinct musical categories: the uniquely Welsh practice of cerdd dant ('the music of the string', for harp and crwth); the Latin liturgy in Wales and its embellishment, and 'Anglicised' sacred and secular materials from c.1580, which show Welsh music mirroring English practice. Taken together, the primary material presented in this book bears witness to a flourishing and unique musical tradition of considerable cultural significance, aspects of which have an important bearing on wider musical practice beyond Wales. 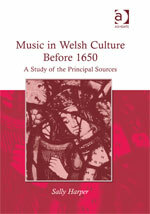 Music in Welsh Culture Before 1650 is published by Ashgate Press. Jointly edited by Sally Harper with Wyn Thomas, Director of the Archive of Traditional Welsh Music. This delightful collection of essays and poems in the area of Welsh music studies is an affectionate tribute to two great ‘Bearers of Song’, Meredydd Evans and Phyllis Kinney. The volume has been assembled by their friends and colleagues as a celebration of their immeasurable contribution to the culture, music and language of Wales over the last fifty years. All of the material is presented fully bilingually in both English and Welsh, and there are numerous musical examples and illustrations. Two of Wales’s leading poets, Tony Conran and Gwyn Thomas, offer specially-commissioned works for Merêd and Phyllis, while Robin Gwyndaf contributes the poem that gives the volume its title. There is also a warm appreciation of the couple’s joint achievement by R. Geraint Gruffydd and an extensive bibliography of their complete writings by Huw Walters. 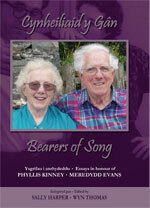 Bearers of Song is published by the University of Wales Press.